1. Saint Patapios was born in 380 in the Egyptian city of Thebes. Desiring to live a life like the Egyptian ascetics, he decided to leave for the Egyptian desert as a young man where he became well known for his ascetic deeds and holiness. The more people came, the more he tried to conceal himself. No longer able to find peace in the desert he set off for Constantinople in 428. During his voyage, he met his disciple Sechnuti, who was an Egyptian rower. 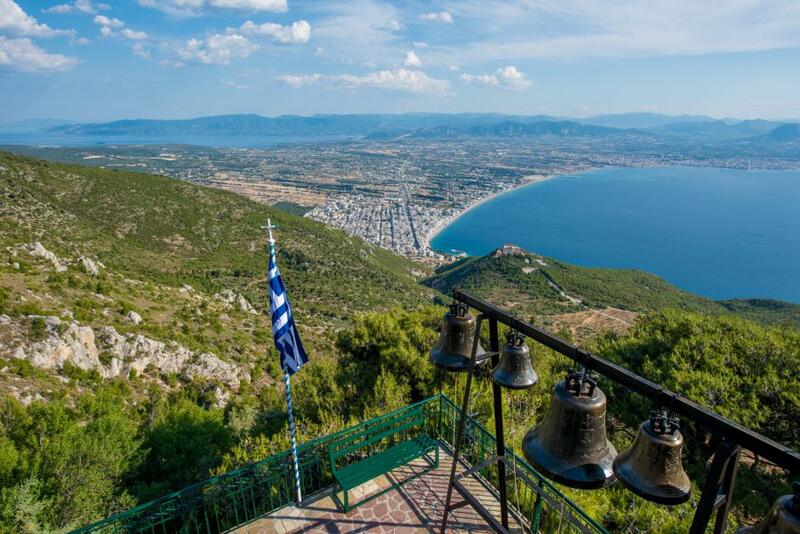 Their ship passed near Corinth where they stayed for seven years in cave. By 435, after seven years in Corinth, Patapios left his skete in the Geranian mountains to resume his journey to Constantinople taking with him the monk Sechnuti. In Constantinople, they secretly went to the Monastery of Blachernae, where he obtained a cell in the city wall. Patapios kept his identity a secret and resumed a life of strict fasting, vigil and prayer under the guise of a simple monk. Here he performed many miracles of healing. After a life adorned with virtue and miracles, he died at the great age of eighty-three in 463 and was buried by his disciples in the Church of Saint John the Forerunner in Constantinople. 2. One thousand years after the repose of the Saint, when the Turks captured Constantinople in 1453, his relics where removed and taken to the little cave in Corinth (as he had requested during his lifetime). The Saint's body was hidden behind a western wall in the cave facing the iconostasis and chapel they built. The memory of the Saint's whereabouts soon disappeared. 3. In 1904 a local priest, Father Constantine Sosanis, was serving the chapel in this cave. He was an unnaturally tall priest who regularly served this small chapel and because of his height commissioned some changes to the chapel. The night before the works to the western wall were to commence, Fr. Constantine had a dream in which a monk warned him to "take care when you break the wall because I am on the other side. I am Saint Patapios of Egypt." He was found the next day under tiles holding a large wooden cross on his chest, a parchment scroll with his name, Roman coins, and large leaves covering his relics as fresh as they had been picked that very moment. A sweet fragrance also exuded from his incorrupt relics. 4. The holy relic is now in a special wooden structure at the back of the cave. Inside the cave there are also Roman wall paintings from the 13th century, with three prominent figures of St. Patapios, St. Ipomoni and St. Nikon. The monastery church is dedicated to the Virgin Mary and contains at its center the Mother of God for veneration. The church also holds the relic skull of St. Ipomoni (Empress Helen Dragash) and part of the hip bone of St. Nikon. 5. 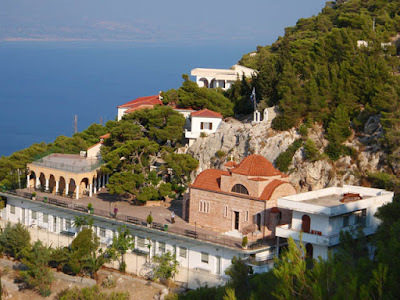 In 1952 a Greek priest, Father Nektarios Kyriakos, built the all-female monastery on this site. The local people initially resisted this idea since the location of the monastery is very difficult to reach even to this day. 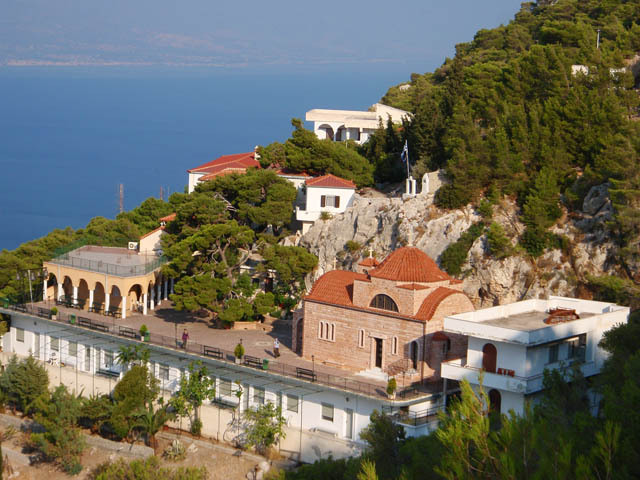 After the founding of the monastery, Sister Patapia was nominated as Abbess, with Father Nektarios Kyriakos as its spiritual leader. Today, there are some forty nuns living in the cells of the foundation and the current Abbess is Mother Isidora. They are very philanthropic and run an old age home for women. 6. 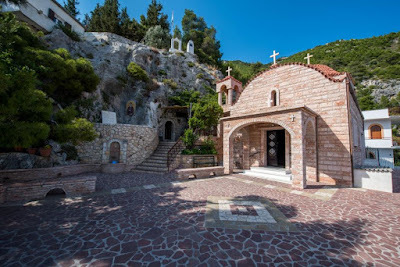 Since Saint Patapios' relics have been discovered, many people have been visited by the Saint in visions and dreams asking them to visit "his house in Loutraki." He is especially known for healing cancer, and miracles occur throughout the world, including as far off as Australia and America. 7. The monastery is 65 to 70 meters up on the Geranian mountains. 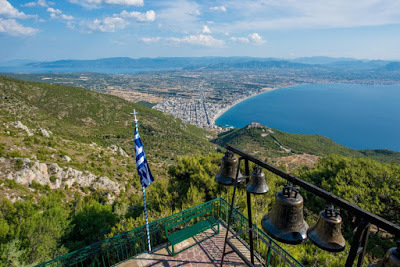 To arrive at the monastery one must climb up 180 steps, which will bring you to the courtyard and fountain of the monastery, and an astonishing view of Loutraki and Corinth. 8. The monastery can accommodate visitors in small numbers in the cells it has. In front of the coffin which contains the relic of the Saint, there is a dent in the ground, which some say was made by the great number of people who visit this monastery and kneel before him. 9. Saint Patapios is celebrated on December 8th, and on Easter Tuesday the monastery celebrates the finding of the relics of the Saint.